Partway through the second act of Divinity: Original Sin 2, you visit an area called the Blackpits. While you’re there, you get into a fight. It is not an easy fight. At around 10:30PM last night, I loaded up the game. I picked up immediately after my party had entered the main area of the Blackpits. I’d just reached level 13, and this was a level 13 area, so I figured I was in good shape. A little while later, I got into a fight with some Voidlings that quickly escalated. And escalated. And escalated. Before long, my party was standing atop a platform surrounded by enemies, and the whole world was on fire. My frame rate, which normally sits well above 100fps in this game, had dropped into the 30-50 range. Even my PC was freaking out. I spent the next hour and a half cursing at my screen, frantically adapting to increasingly unfavorable battle conditions, and marveling at the fact that everyone in my party was still alive. First came a wave of Oil Voidlings, which were numerous but easy enough to kill. Then came the Fire Voidlings, which were numerous and much harder to kill. They were joined by burly Primordial Fire Voidlings, which kept hurling fireballs and curse spells at my party from a distance. Also the fire they were standing in healed them with every turn. I had the elevated position, but it seemed only a matter of time before my party was overrun. It looks like a burnt marshmallow, but rest assured, it is much meaner. More than a few times, a mistake or miscalculation lead me to reload and try again. (It is all too easy to click on the wrong thing when the entire battlefield is obscured by flames and smoke.) I kept my party on top of the tower, spending precious Source points to bless the small surface beneath us and keep it free of Necrofire. (Results on this strategy were mixed.) I threw summoned creatures blindly into the furnace below, hoping they’d distract a couple enemies and buy me a turn or two. I used consumable scrolls and grenades freely, and spent all of my healing and barrier spells protecting Gwydian Rince, the friendly NPC I wanted to keep alive throughout the fight. Everyone was on fire. Everyone was cursed, crippled, or otherwise debuffed. It was a nightmare. I lost track of time, but the tide finally started to turn. We’d thinned the enemy ranks, and I didn’t see any additional waves of enemies coming. Everyone in my party was standing, drained, but still able to fight. 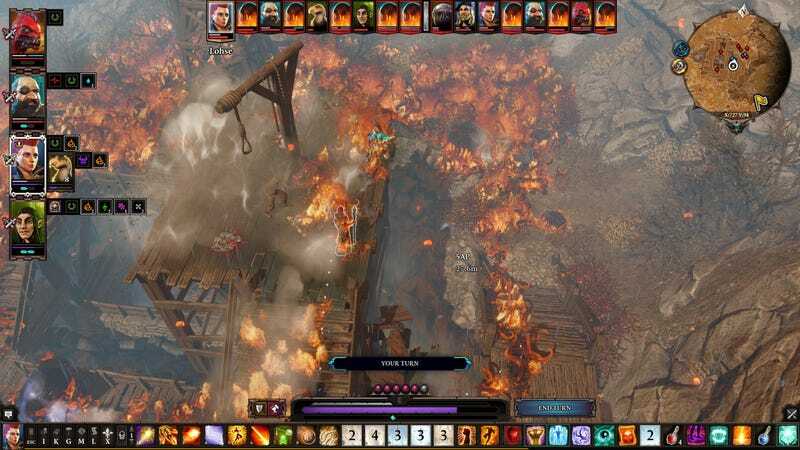 A few minutes later came the wonderful feeling that Divinity: Original Sin 2 players know well: when the momentum shifts, and you know for sure that you’ve won the battle. All that’s left is cleanup. Yet again I had messily turned around a no-win scenario. It was almost as though it hadn’t happened. But it did happen, and man, it was intense. I beat the Blackpits fight through a combination of luck and stubbornness, but I had no real strategy. I have a feeling that several of you are champing at the bit to leave comments about how actually, this fight isn’t all that hard. I don’t doubt there are some more creative paths to victory, at the very least. If you beat the Blackpits fight, how did you do it? I’m all ears.